Health officials in the Democratic Republic of the Congo (DRC) reported two additional Ebola Virus Disease (EVD) cases Thursday, bringing the cumulative number of cases is 993, since the beginning of the epidemic. In addition, seven new EVD fatalities were reported bringing that total to 621. 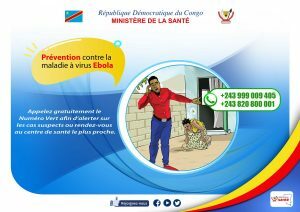 The World Health Organization noted that the outbreak in North Kivu and Ituri provinces has recently shown an increase in the number of cases reported by week, with Katwa, Butembo, Masereka and Mandima accounting for over 80% of all cases in the last 21 days. Officials say the rise is not unexpected and, in part, likely a result of the increased security challenges, including the recent direct attacks on treatment centers, and pockets of community mistrust, which slowed some response activities in affected areas for a few days.